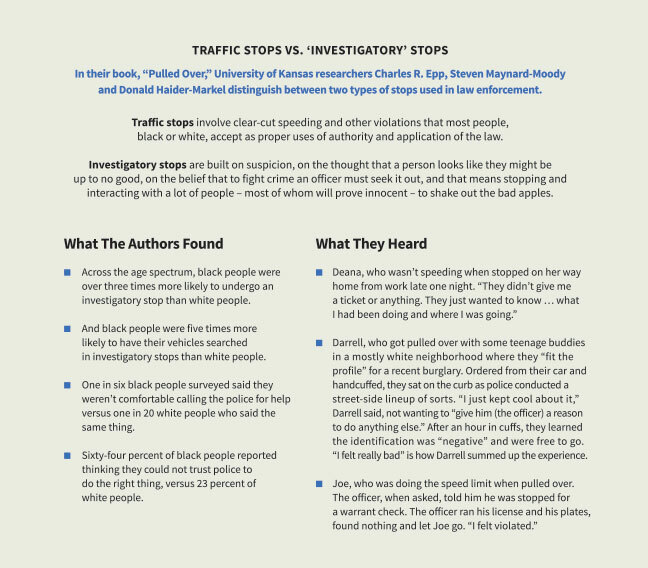 A surprising revelation led professors at the University of Kansas to identify a widely accepted police practice – the investigative stop – as a threat to the rights of racial minorities. This is the story of their provocative interpretation and how it became a book that’s prompting dialogue in the law enforcement community. calls a “holy crap” moment. Sitting in a Lawrence coffee shop, Epp was paging through several dozen narratives he and his fellow researchers had collected. The stories sprang from a survey of more than 2,300 Kansas City-area motorists that took an in-depth look at the consequences of police stopping drivers. Feeling he was onto something but not sure what, he sorted them into two piles – one detailing the stories whites told, the other describing the experiences of black people. The narratives captured voices that had not been extensively studied or heard in discussions of motorists pulled over by police: the drivers themselves. From those stories they learned that the experience – of flashing lights, pulling to the roadside and interacting with a law officer – is often profoundly different depending upon whether you’re black, Latino or white. The contrasts that took shape in those separate stacks helped form the basis for “Pulled Over: How Police Stops Define Race and Citizenship,” an April 2014 book from the University of Chicago Press that Epp, a professor in KU’s School of Public Affairs and Administration, authored along with fellow public affairs professor Steven Maynard-Moody and Donald Haider-Markel, a KU political science professor. It wasn’t just that black people were more likely to get pulled over by the police than whites. For many African-American drivers, “It’s like, ‘Duh.’ It’s obvious. They live this,” says Maynard-Moody. No, what was most telling was the deep impact that a very particular type of stop had on African- Americans. Black drivers weren’t deeply bothered by quick stops when police pulled them over and gave them a traffic ticket. It was only when stops – often for a minor violation like a broken taillight or failure to signal a lane change or going 2 mph over the limit – turned into drawn-out investigations, often punctuated by probing questions and requests to search the vehicle, that the stops left a deep impression. Even if the officer ended the interaction by letting the motorists go on their way. The “holy” revelation, the one that led the professors to call the drivers their “teachers,” was their delineation of police stops into two distinct groups: traffic stops and investigatory stops. The distinction is, along with the stories, a major contribution that “Pulled Over” makes to conversations about race and profiling, reviewers say. The findings amount to a striking systemic interpretation about why it’s so difficult to move the needle on a significant adaptive challenge – healing the oft-strained relationship between minority communities and law enforcement. Trying to understand how a police stop “hit so deep” – often not bringing a ticket but leading black motorists feeling “violated” – drove the researchers’ search for answers. The explanation the professors developed was that investigatory stops fall disproportionately on African-Americans – especially young black men – and leave them less willing to cooperate with authorities and even doubt their place in society and as citizens. The researchers found that when African Americans experienced an investigatory stop, it mattered little whether the officer was nice and polite to the driver. They still felt violated. It’s a feeling that more minorities may be at risk of feeling more often, the authors write. Such findings have hit home for some in law enforcement, such as Robert Sullivan, coordinator of the Johnson County Criminal Justice Advisory Council. Exploring a tough interpretation about something like police investigatory stops might be enlightening, but it’s not exactly comforting. This way of diagnosing a situation means looking beyond a scapegoat and instead working to understand how policies, people, systems and culture fit together to create a problem. Using this kind of explanation to drive what you do is fundamental to exercising leadership well, but it also means embracing a challenging, drawn-out process of incremental change and weighing trade-offs. For the officer on the street, pretext stops – another name for investigatory stops – carry useful benefits and have led to newsworthy arrests and drugs being taken off the street. It’s seen as a fundamental way to stop more serious crimes before they happen. The opposite view, one the KU researchers take, is that many, many police stops are required to make those arrests and seize those drugs, and the cost to the innocent drivers stopped and let go in the process isn’t worth the trade-off. Throughout their book, the KU authors were able to point toward some of the lesser-noticed consequences of stopping lots of drivers for minor, sometimes even contrived, offenses in the hope of finding a few criminals. They documented how, being pulled over more often, members of the black community share those stories, reinforcing distrust of police. They heard recollections of being followed home night after night by police, of being handcuffed at curbside and then being released with little explanation, of an officer pulling a gun because a driver asked why he’d been stopped, and of the overall feeling of being violated on both a legal and personal level. What Epp and Maynard-Moody found is provocative because the practice of using investigatory stops is deeply embedded in training and criminal justice theory, with some departments acknowledging they use the approach and others practicing it somewhat quietly and to varying degrees. But it results, the authors say, in a form of institutional racism – one where the practice is responsible, not the people practicing it – that is very difficult to get your head around, not to mention confront or resolve. Factoring into the discussion are studies like one in New York City that found that police found drugs or guns in less than 2 percent of stop and frisk searches. The debate over police stops and other intrusive practices involves weighing competing values that include the desire for public safety and police visibility versus others in the community feeling resentful and less safe when police are around. However, there’s a larger context that also needs to be understood. Reducing the use of something like the investigatory stop means re-examining the ways in which law enforcement has worked and finding other effective ways of doing their jobs. “Pulled Over” came out just before the 2014 Michael Brown shooting death in Ferguson, Missouri, which didn’t involve a traffic stop, and more than a year ahead of the controversial fatal shootings of Walter Scott in North Charleston, South Carolina, and Samuel DuBose in Cincinnati, both of whom had been pulled over by police. The researchers didn’t expect the book to lead to quick change. In fact, they believed that change, if it came, would come slowly. Still, they felt driven to change the conversation. “I remember feeling very strongly through that summer, after Michael Brown was shot, that a big part of the underlying reality was just being missed in the discussion,” Epp says. “Usually what you see if you look at all of the post-Ferguson events in particular, the leadership narrative is what we would call the ‘bad apple narrative.’ So it’s not the fault of the department, it’s not the fault of the leadership of the department, it’s the fault of a few bad apples overreacting, or of a racist cop,” Maynard-Moody says. “If you say the problem is institutionalized racism, which is a very legitimate statement, it’s almost like, ‘Whoa, we can’t deal with that.’ When you get it down to various clearly articulated institutionalized practices, then you can change practices. Those can be changed,” he says. When newspapers called the authors asking for comment on this shooting or that, they sometimes felt “strange” to be looked to amid the tragedy. They felt far more comfortable to have others, black journalists among them, take in their ideas and have a new frame of reference. Their proposals address investigatory stops on several fronts – including departmental policies, training and the courts – and in steps both immediate and longer term. These include banning stops where there isn’t a clear violation of the law and requiring officers to clearly record the reason for each stop. In addition, they say, searches should be banned unless there is clear probable cause of a crime, as “consent” searches often leave drivers feeling like they have no choice but to say yes, contributing to feelings of violation and bias. They maintain the courts bear responsibility, as rulings have helped legitimize investigatory stops, yet concede change isn’t likely to come quickly via that avenue. Still, a 2016 dissent by U.S. Supreme Court Justice Sonia Sotomayor citing their book holds out the possibility of change. Most directly, they say senior police officials have the greatest, most immediate power to alter policies and practices and drive change in training methods that prescribe investigatory standards as an effective law enforcement tool. “I have immense respect for progressive police chiefs and command-level officers. They’re often really trying hard to do the right thing. In many areas, they are committed to community policing and good relations with neighborhoods. Ironically, at the same time in some of those places, they are also deploying this kind of stop,” Epp says. Having been tipped to “Pulled Over” by a colleague, and finding much to mull in its pages, Sullivan asked Epp to speak at the advisory council meeting. The county, he says, has been working on a number of fronts to be more inclusive of minority residents. The book fit well into those discussions. Those affected have increasingly owned the problem, raising their voices against police stops that disproportionately affect them and their community. 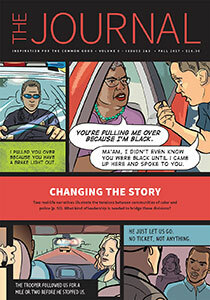 In some communities, such as North Charleston, use of the stops has plunged. As a result, it’s become possible for more people in law enforcement and beyond to consider the potential downside of the investigatory stop and begin reconciling that with what they know about creating safer, lower-crime communities. This entry was posted in Race and Ethnicity and tagged Police, race, stops. Bookmark the permalink.